Wesley Ahlgren (right), chief operating officer of the Coachella Valley Economic Partnership, and Julie Lappin, transitional manager of the Coachella Valley iHub, welcome Ben Lizardi, vice president of Electric Vehicle Enterprises, to the green business incubator in Palm Springs. PALM SPRINGS — The Coachella Valley’s green business incubator has its first fledgling firm, Electric Vehicle Enterprises, a company that converts regular cars into electric vehicles. Ben Lizardi, vice-president and director of marketing for the company, was settling into his new office Wednesday at the valley’s iHub — located at the Coachella Valley Economic Partnership’s Rabobank Regional Business Center in Palm Springs. The company takes conventional cars and converts them to all-electric vehicles with a range of 75-100 miles, he said. “Our feeling is why build a total electric car from scratch when you can convert and recycle 3,000 pounds of steel, plastic and glass,” he said. Businesses going into the green incubator get free office space and business support services such as help with business plans and connections to potential investors, said Wesley Ahlgren, chief operating officer for CVEP, which operates the iHub. The incubator itself is a joint project of Palm Springs, Cathedral City and Desert Hot Springs to draw green business and jobs to the valley. Ahlgren said Electric Vehicle is a good fit. The company is a merger between two electric vehicle companies, the original Electric Vehicle Enterprises, started by Lizardi and his son-in-law in Pasadena, and Electric Blue Motors, an Arizona company started by Bill Schlanger, who has a background in automotive engineering. The two joined forces earlier this year and started scouting locations for a manufacturing facility, checking out locations in Phoenix and as far afield as Iowa. Palm Springs won out because Lizardi has a home here and Schlanger, who obtained his college degree at UC Riverside, is from the region. 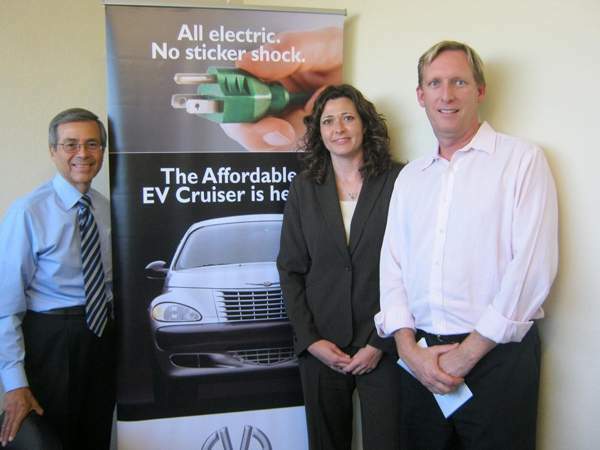 Going forward, Electric Vehicle will look for manufacturing space and hopes to start up here by early 2012. Lizardi projects the company could create 40-50 jobs over the next few years. The company also will create do-it-yourself kits to sell. He will work with Julie Lappin, the newly hired transitional manager of the iHub, who has a background in patent law and moving technology from research and testing in to the field. K Kaufmann covers energy and green technology, retail, and health care for The Desert Sun. She can be reached atk.kaufmann@thedesertsun.com or (760) 778-4622.